Dr. Jim Bryant and PTHA board member Kate Demasi at Parx for Hall of Fame induction. Page McKenney, owned by Adam Staple and Jalin Stable and trained by Mary Eppler, won the MATCH Series 3-Year-Olds and Up Long—Dirt Division and on Sept. 15 was among those honored at Parx, where he won seven of 10 starts, five of them stakes. 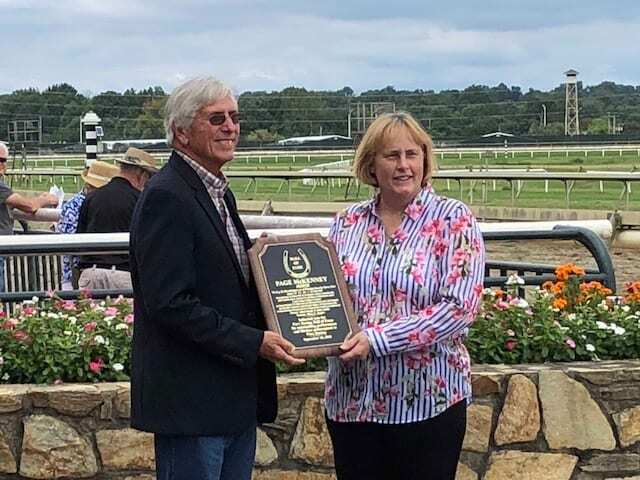 Dr. Jim Bryant, who co-bred Page McKenney with Linda Davis—they make up Jalin Stable—was on hand to accept the Hall of Fame plaque. “Some of his most exciting races were here,” said Bryant, an owner and breeder who lives in Virginia. “When he won the Roanoke Stakes and PA Derby Championship Stakes last year, those were probably my favorites. But his race in the Swatara Stakes at Penn National really stood out, too. Kid Cruz came flying up to him in the stretch and went to eyeball-to-eyeball with him and he just wouldn't let him go by. The Parx Hall of Fame, organized by the Pennsylvania Thoroughbred Horsemen's Association, also inducted four individuals: Dr. Patty Hogan, who operates an equine clinic in New Jersey; Russell Jones Jr., a Pennsylvania Horse Racing Commission member and lifelong horsemen with involvement in the auction sector; Ed Rendell, the former Pennsylvania governor who signed the Pennsylvania Race Horse Development and Gaming Act into law in 2004; and trainer Richard Vega, who has won many races at Parx since he got his trainer's license in 1992 and in 2016 won his 1,000th race. Danielle Montgomery, who administrates the PTHA's Turning for Home aftercare program, said Hogan, for the first five years of the program, performed many surgeries and consultations on racehorses that entered the program for new homes and second careers. Hogan studied veterinary medicine at the University of Pennsylvania. Rendell, who at this time isn't involved in politics, was represented at Parx by Steve Crawford, his one-time chief of staff who was a point person on the gaming legislation in 2004. Crawford discussed what many people have long believed: The 3-year-old campaign of Pennsylvania-bred Smarty Jones that year definitely fueled passage of the bill. This entry was posted in NL List, Racing and tagged adam staple, hall of fame, jalin stable, mary eppler, MATCH, match series, page mckenney, parx, parx racing hall of fame, Pennsylvania by MATCH Series Release. Bookmark the permalink.